The following photos show something of the work involved in the chapel, in the hopes that you might find them interesting and perhaps even a source of some inspiration. There's a bit of 'chicken and egg' in this chapel because installing lights means that there absolutely had to be a detailed interior although not bothering to detail the interior wouldn't have been noticed if I hadn't installed lights! Some people just make work for themselves! 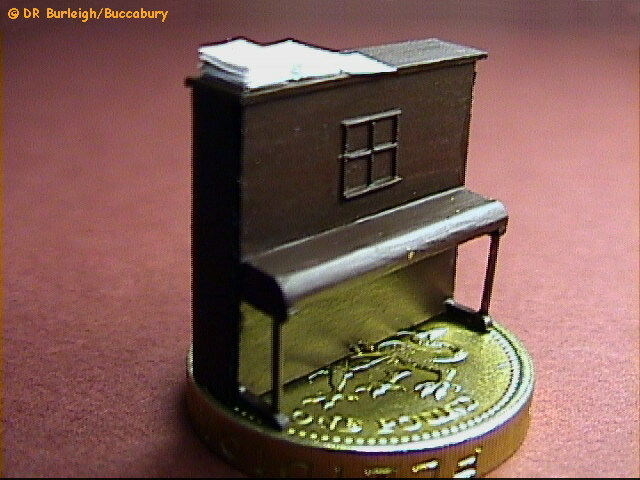 Nevertheless, I'm delighted with the finished result, the quality of which puts all my other buildings to shame. I looked out for every Welsh chapel I could find (and there's loads of them!) for inspiration, learning in the process that they most certainly do not always lie east-west as do English churches and cathedrals. I eventually found THREE likely candidates in Abergynolwyn village and discovered that one of them was just about the right size for my plot of land. If you'd like a look at some of the inspiration for this chapel, click here or here to see a picture of the completed Chapel. 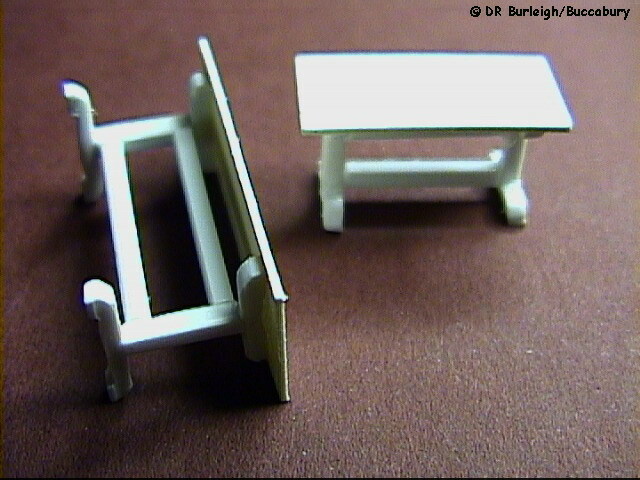 I should mention that these construction photos were all taken on the workbench with a fairly low-resolution camera. Clicking on the thumbnails will open a larger view; use your pc's 'back' button to return to this page. © DRB/Buccabury The basic shell of the building uses laminations of 0.5mm thick artist's card. After setting out with the usual drawing equipment, embossing the walls was achieved with a compass point and working freehand for a random appearance. The shape of the point tends not to leave a raised edge to the embossed lines. After embossing, the walls were coloured with a 2B pencil. © DRB/Buccabury Window apertures were set out using the illustrated window as a template; they were then cut using a new scalpel and arched stonework was scribed (this was done before any other embossing on the walls). 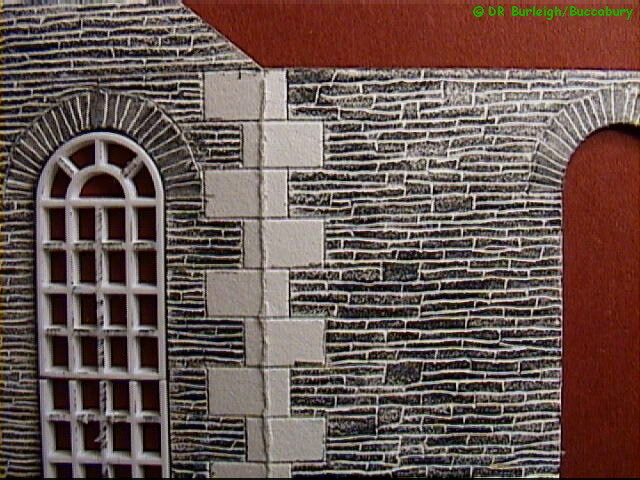 The corner stones were set out and embossed next, using a ruler to give the clean dressed edges. They were carefully avoided when it came to colouring the walls. 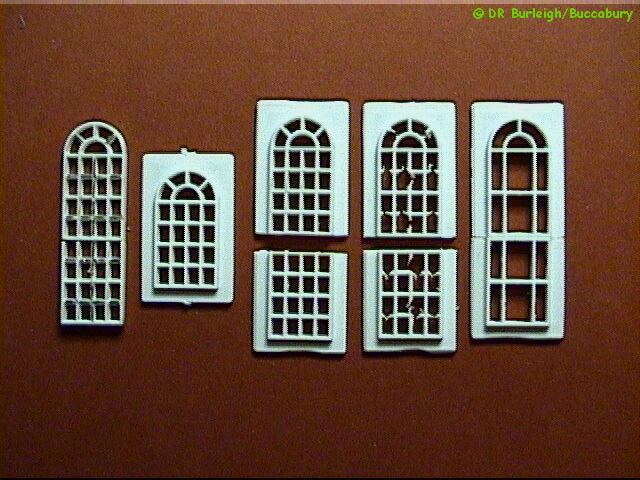 © DRB/Buccabury Stages in the development of the windows from the standard Ratio plastic window moulding. 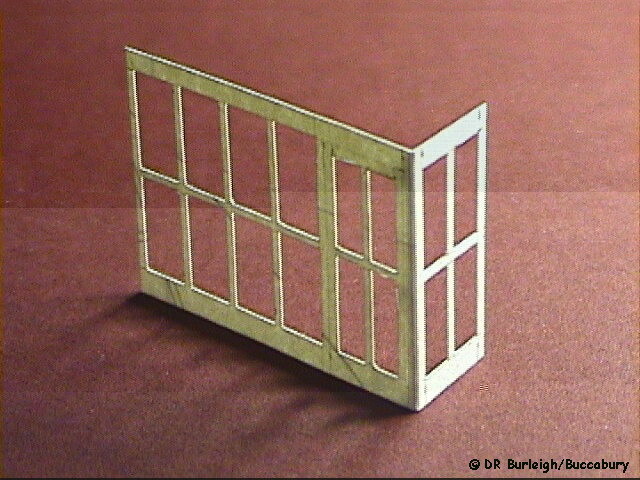 The trial window which was used for marking out the apertures in the walls and determining which bars should be removed, is on the left. The windows sections were butted together, and the joint relieved at the rear and flooded with white paint, which was also needed on the whole frame to prevent light transmission. 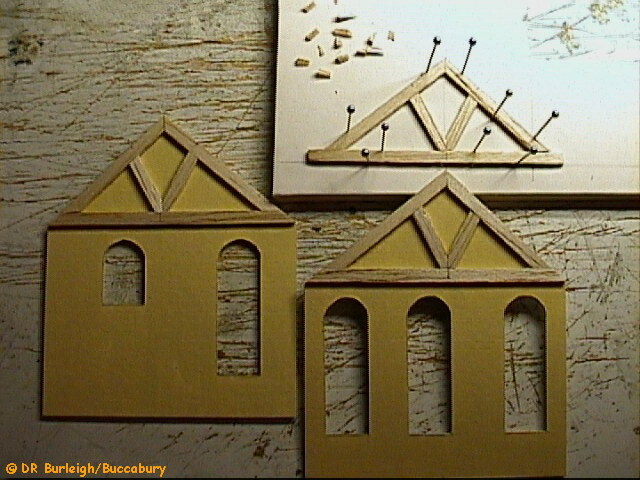 © DRB/Buccabury The roof beams were drawn out on foamboard and balsa wood was cut and glued using pins to hold them in place. 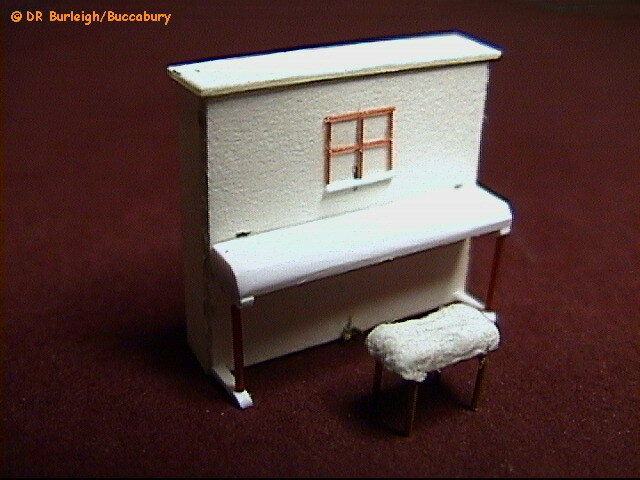 All sets were built up one on top of the another and when dry were carefully parted with a scalpel. This view also shows the inner end walls. © DRB/Buccabury The design of the building is a three-quarter depth exterior but this would have looked wrong inside. Therefore the interior is built symmetrical. 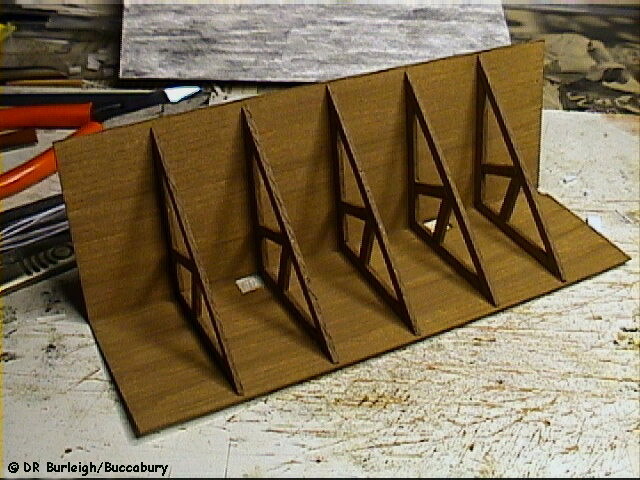 This shows the completed false roof structure which sits inside and underneath the main roof. 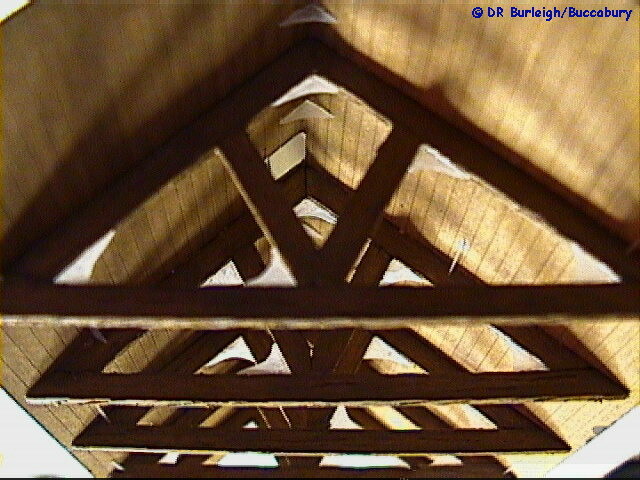 Again, roof boards are embossed with a compass point. 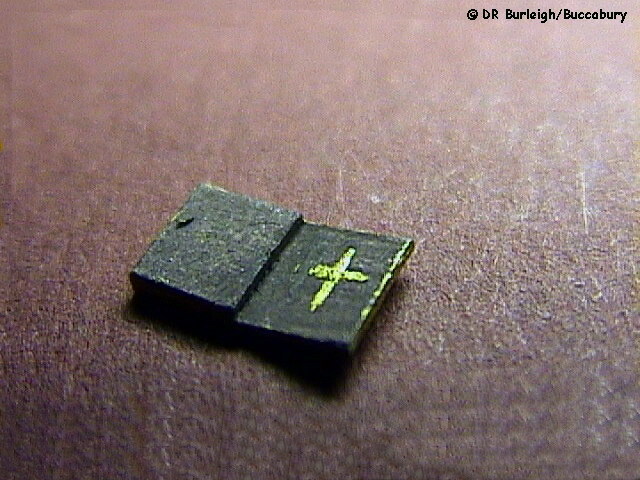 The two square apertures for admitting the light can be seen. © DRB/Buccabury Looking up into the roof, showing some of the cobwebs which were installed. 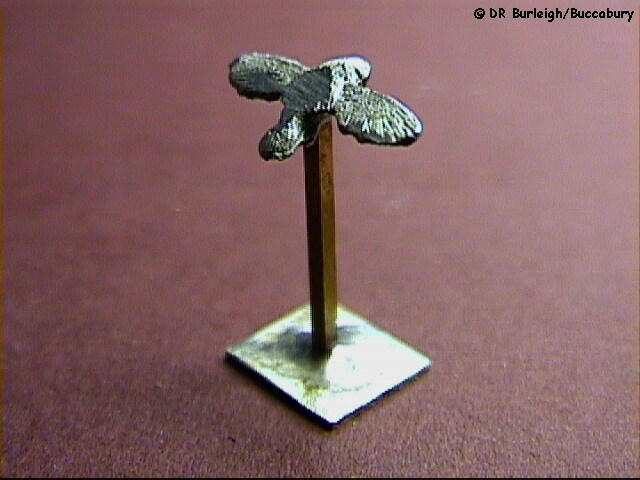 These are cut and shaped from 20-thou clear styrene which has been frosted by rubbing with fine abrasive paper. Each of the 70 cobwebs in the building took about 10 minutes to produce and fit. Do the sums! © DRB/Buccabury The part completed interior showing many (unpainted) details including the lobby, pews, stove, table, the lighting cables (which run inside the end wall), the end beams for the false roof and an indication of the resulting roof space which was used for the lighting duct. Also apparent is the use of black paint on edges and thinner parts to stop light leakage. 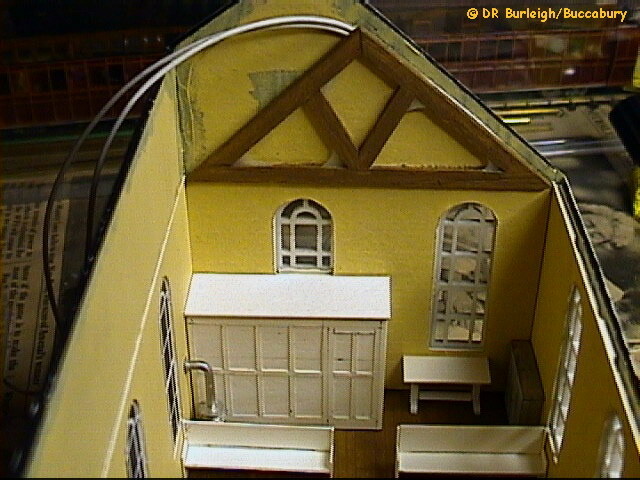 © DRB/Buccabury Another view, showing the back wall and the false rear windows in their blind apertures. The windows were produced by placing a finished moulding on a piece of black card and photocopying it. In daylight they are not noticeable but the night view is very convincing and light doesn't pour out onto the backscene and spoil the effect. The end walls were not in place at this time and more black paint can be noticed. 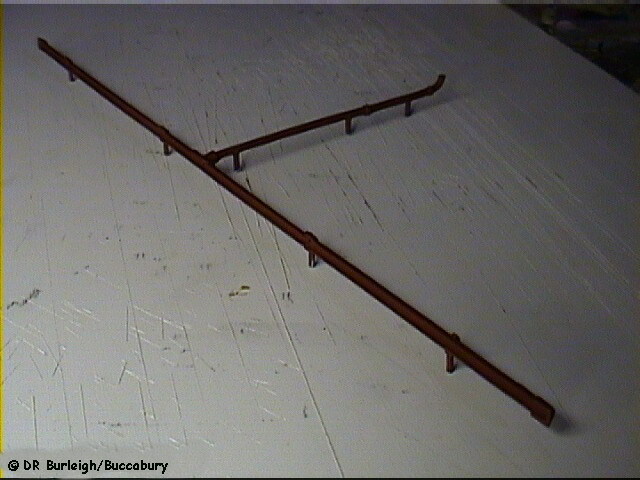 © DRB/Buccabury Scale Link half-round guttering was soldered up as one unit and painted, and then carefully marked out and fixed into holes drilled into the walls. Before fixing, a certain amount of weathering was applied to the areas behind the gutter and downpipe. © DRB/Buccabury The paper fret for the panelling on the lobby. This was the third attempt! The other two failed as they hadn't been set out correctly to start with. A new scalpel had to be used each time. The lobby door was completed with hinges and doorknob. © DRB/Buccabury Two communion tables, built from styrene with card tops. The larger of the two is the preacher's, whilst the other is installed at the rear of the building, adjacent to the lobby. © DRB/Buccabury The lectern. 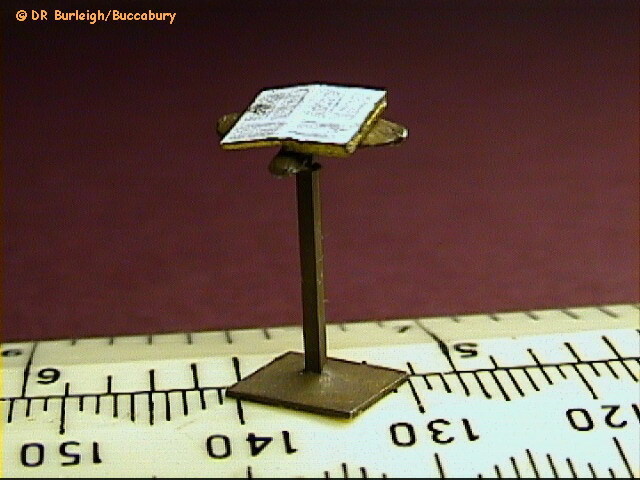 The base is from 20 thou brass sheet, the stand from 40 thou brass square section and the cast whitemetal owl from the Langley range of birds; its back has been filed flat to take the bible. © DRB/Buccabury The bible is made from three sections of artist's card. The edges are gold blocked but now it's mounted on the lectern sadly the gilt cross can no longer be seen! © DRB/Buccabury The lectern and bible completed. Dimensions and text layout details for the bible were taken from a large old family bible in my possession. The ruler gives an indication of the size of the model. © DRB/Buccabury The unpainted piano with stool accompaniment. 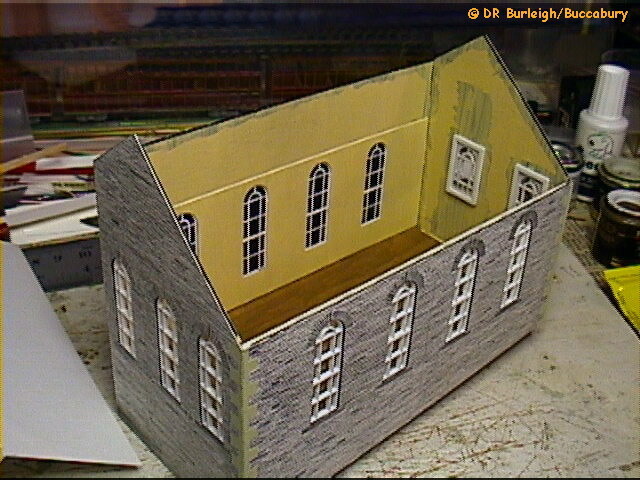 Construction is card and styrene, and the stool has brass legs; one leg is longer than the others and the stool is fixed into the chapel by putting this through a hole drilled in the floor and gluing. © DRB/Buccabury The piano finished, complete with music books, brassed foot pedals and sitting on a pound coin - a Welsh one, naturally! It is slightly over-tall but is only temporary until I find a suitable harmonium to model. © DRB/Buccabury The chapel's lighting system consists of two grain-of-wheat lamps in a card duct built onto the false inner roof, and fully covered and enclosed with a removable lid for access. This lid has a labyrinth seal to prevent light leakage. The duct and feed cables fit neatly into the void formed between the inner roof and the outer roof. © DRB/Buccabury The interior completed, showing the roof void painted black to reduce light transmission and reflection. The interior lamps were very carefully positioned to avoid light spilling onto the backscene and spoiling the illusion of distance. 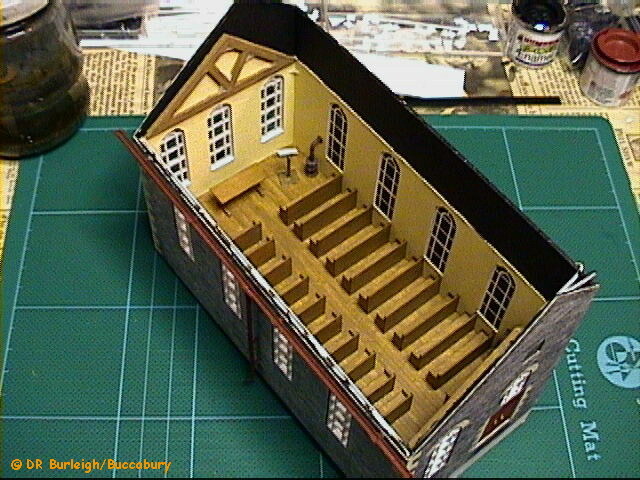 24 pews were made up from card and the best 20 selected and painted. © DRB/Buccabury The preacher's end. The 70th and FINAL cobweb can be seen in the corner above the lectern. 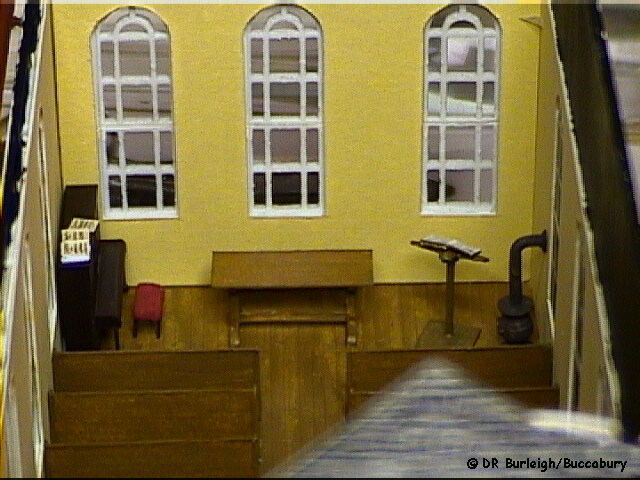 I've also installed a cobweb under one of the pews! I know which pew it is because there's a prayer book on the seat! © DRB/Buccabury A close-up showing the roof and east wall. 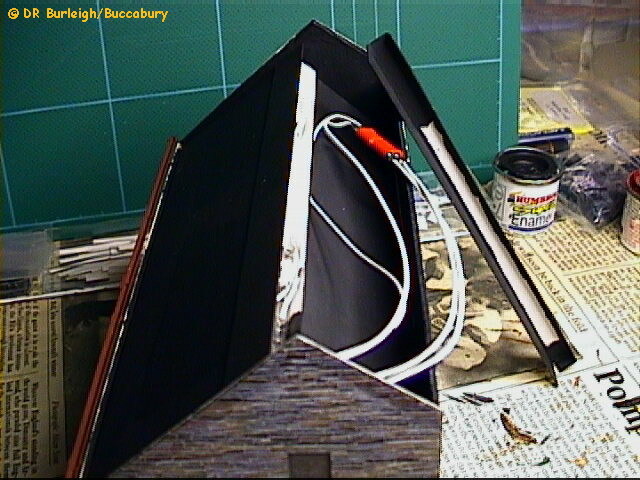 The Howard Scenics slates were glued directly to a card former, using lines carefully ruled onto the former in order to keep them straight and even. I elected to represent lead roof ridging held down with iron straps. The doors are fitted with Midland Railway carriage door handles. © DRB/Buccabury A close-up of the completed chapel garden. 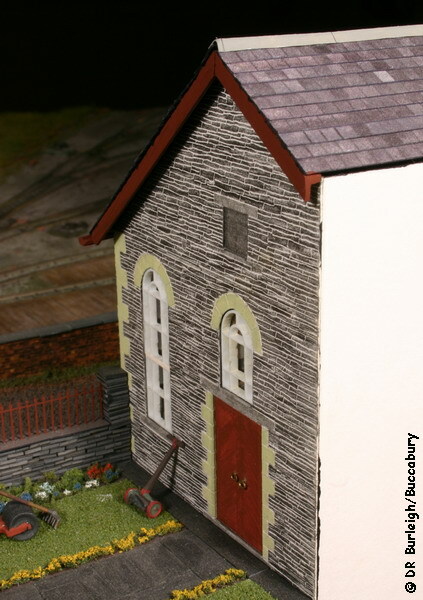 Vegetation is Woodland Scenics material, painted where appropriate, garden tools are by Scale Link and the iron fence is adapted from the Langley No.F126 etched brass fret. 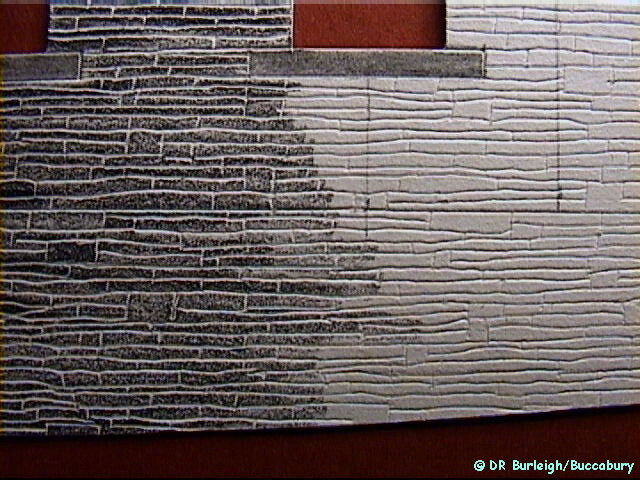 The wall is produced by building up almost as per prototype with 1mm thick black styrene blocks to represent dressed slate.